Amazon Summer Sale (3rd – 7th May) : Upto 80% Off + Early Access to Sale for Prime Members on 12 AM, 2nd May. Amazon Great Indian Sale Cashback Offers : Be ready to shop from Mobiles, Computers, TV, Appliances, Electronics, Men's Fashion, Women's Fashion, Home, Kitchen, Pets, Beauty, Health, Grocery, Sports, Fitness, Bags, Luggage, Toys, Baby Products, Kids' Fashion, Car, Motorbike, Industrial, Books, Movies, Music & Video Games, Gift Cards & More. Stay tunes for more updates. What Offers you can expect during Amazon Great Indian Sale 2019? Amazon Great Indian Sale is the celebration and deals on top products from 200 plus wide categories. Enjoy this celebration by grabbing 20000 plus deals and offers on different products from fashion, clothing, home appliances, electronics and more. Get extra discounts during Amazon Great Indian Sale offers 2019 by using exclusive Amazon coupons check for coupons on kitchen & appliances, Bags & luggage, Home & decor, Daily essentials coupons. All these Amazon Great Indian Sale are available with 10% HDFC debit & credit card discount along with 6.5% Zingoy cashback rewards. 1) Choose the product you want to buy. 2) Collect the coupons available for the product. 3) Add the coupon to the cart. More than 3 lakhs stylish and designers clothing for men, women, and kids with upto 80% off. Install Amazon shopping app on your device during Amazon Great Indian Sale and get upto 60% offer over more than 17 crore product. Don't miss the golden hour deal every 8 pm midnight with the guaranteed fastest delivery. What is the Amazon Great Indian Sale Date, Time & Sale Duration? Amazon Great Indian Sale date has been announced. Here is the complete schedule of the Amazon Sale. If you have Amazon Prime Membership than you can grab this exclusively offers & deals 30 min before the Amazon Great Indian Sale starts. Non-prime members can purchase the subscription at just Rs 129. Check out some of the deals & offers available for Amazon Prime members during the festival sale. Sale starts on 19th Jan 2019 at 12PM early access for Amazon Prime members. Some of the highlighted deals for Amazon Prime members. Purchase electronics, tv, washing machine, home & kitchen appliances with a huge discount from the top brands like Samsung, Sony, Panasonic and many more all the products available during Amazon Great Indian Sale offers are with warranty and available at attractive price. If you are the book lover and love to enjoy books of different generic than you can save more on the different collection whether horror, thriller or kids books during Amazon Great Indian Sale offers you get exciting deals and offers on collection use Amazon coupons to get extra discounts. You can also get a good Amazon Gift Card offers on Zingoy. Amazon Great Indian Sale is back with the exciting new year offers. If still looking at that cellphone longingly? Wish those shoes were a little cheaper? Have a cartful of unordered products? Here's your chance to buy all those things and more. So, get ready to grab some eye-popping Amazon deals, MRP crushing coupons and mind-blowing Amazon cashback offer on a wide range of products and top brands from Amazon. And unlike other sales, the Amazon sale promises fast and on time deliveries with its same day, one day, two day, scheduled, Sunday and morning delivery options. So, start listing down everything that you wish to buy without worrying about the budget. Be it clothes, shoes, bags, fashion jewelry, lamps, lights, home decor items, furniture, curtains, bed sheets, mobile phones, TVs, home theaters, oven,sweets, snacks: you name it and you will be able to grab it at a great discount with some amazing Amazon deals and offers. Can’t wait to get started? Wait, just a moment there, because here's a way to help you save more money over and above all those amazing new year deals and offers during the Amazon Great Indian Sale. All you have to do is join Zingoy and get into the habit of earning cashback every time you shop. Grab the opportunity of Amazon Great Indian Sale Offers on Zingoy and get the maximum cashback on some of the top categories like fashion, mobile, laptops, baby products, car, motorcycle and more using Amazon pay balance. Some of the benefits you can grab using Amazon pay balance. Get amazing discounts on the mobile headphones from the top brand like JBL and Sennheiser upto 60% OFF during Amazon Great Indian Sale 2019 along with you can avail Zingoy cashback offers. Be an Amazon prime members and take the benefits of Amazon Great Indian Sale offers. Prime members get the better chance to purchase the products before the actual sale began as it is the fastest finger first opportunity. Bajaj Finserv makes your shopping more convenient and saves your pocket. Make your purchase super exciting by shopping any electronics or large items during Amazon Great Indian Sale offers 2019. Use Bajaj Finserv and buy any products order above Rs 4500 and get no cost EMIs. Get all the Amazon products at one place during Amazon Great Indian Sale. Shop for Amazon Fire TV Stick, Amazon Echo, Amazon Kindle and more along with Amazon Great Indian Sale offers you can grab for exciting cashback opportunity on Zingoy. Grab upto 80% off on the top brands like Gap, United Colors of Benetton, Under Armour, Indigo Nation, Puma, Manyavar, Arrow, Raymond, Reebok, Adidas, Lee, Wrangler, Pepe and many more with 6.5% Zingoy cashback. 10% HDFC bank cashback along with the Zingoy cashback. Amazon Great Indian Sale on TV from the brands like Micromax, Sanyo, BPL, TCL, Panasonic, LG, Samsung, and Sony get upto 50% off during this Amazon Great Indian Sale 2019 with Zingoy cashback. 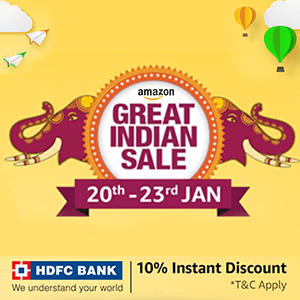 Amazon Great Indian Sale offers on bags and luggage get upto 80% off with 10% HDFC bank cashback grab these offers during this Amazon Great Indian Sale. Amazon Great Indian Sale offers on Shoes: Grab upto 90% off on men's, women's and kid's shoes along with 10% HDFC bank cashback over 6.5% Zingoy cashback rewards during Amazon Great Indian Sale 2019. Amazon Great Indian Sale offers on clothing & apparels: Get upto 80% off men's and women's clothing from the top brand with zing cashback. Amazon Great Indian Sale offers on large appliances: Upto 60% off on large appliance during Amazon Great Indian Sale offers 2019. How to grab best Deals & Offers during Amazon Great Indian Sale? Amazon Great Indian Sale is once again back on 20th-23rd Jan 2019 with exciting offers on all the Amazon shopping products. Get a huge discount on fashion, clothing, electronics, mobile, home appliances and more products at best offer price during Amazon Great Indian Sale 2019 along with Zingoy cashback. Amazon Great Indian Sale offers on visa card get flat 10% cashback along with extra rewards from Zingoy. Amazon Clearance Sale offers on electronics upto 80% off on top brands. Amazon Shoe Refresh Sale offers to get upto 80% off on top brands. Amazon Great Indian Sale offers on ACs & Fridge and get Rs 10000 off on exchange. Amazon Great Indian Sale offers on kids clothing upto 80% off on top brands. Take the advantage of Amazon Great Indian Sale offers and shop from more than 1 lakh plus styles from top fashion brands for men, women, and kids and get minimum 50% off choose from the wide collection on Amazon with 30 days return as all the products available during Amazon Great Indian Sale are quality assured. Along with these Amazon offers you can earn rewards from Zingoy. Make your Diwali delightful by bringing home TV, air conditioners, refrigerators, and more electronics items during Amazon Great Indian Sale. Purchase all the electronic items from Amazon at the unbelievable price also get best exchange offers and deals. EMI options are also available using credit cards with no interest charge along with these exciting offers during Amazon Great Indian Sale you also get cashback rewards from Zingoy. Upto 70% off on make-up applicators, pedicure & manicure kits, epilators, beauty cases etc from top brands like Philips, Generic and many more. Choose from bathing accessories, cotton & swabs, facial steamers, foot care, hair combs, wigs & accessories, hair styling tools, makeup brushes & tools, mirrors, nail tools, refillable perfume bottles and more along with these Amazon Great Indian Sale offers to earn Zingoy rewards. Shop for the LG 55 inch 4K Ultra HD Smart OLED TV at the best offer deal during Amazon Great Indian Sale. Use Amazon pay and get extra 10% Amazon pay cashback with 10% HDFC bank offer along with the Zingoy cashback rewards. Amazon exclusive offers on Mi TV pro series sale starts today. Choose from the wide range of products during Amazon Great Indian Sale and get upto 80% off from popular brands like Micromax, Symphony, Classic, Haier, Voltas, Onida, Panasonic, LG and more and get upto 6.5% Zingoy cashback. Check out some of the categories to grab Great Indian sale offers. Grab all the home & daily essential products at best price during Great Indian Sale offers. Get maximum discount and offers upto 80% on beauty & grooming, health & household essentials, styling devices, baby products, groceries, pet supplies, luxury beauty & fragrances, healthcare devices and more with extra Zingoy cashback. Best deals and offers to grab on all the electronic products with exchange during Amazon Great Indian Sale 2019. Amazon Great Indian Sale offers on air conditioners, refrigerators, microwaves, chimneys, and more electronic items. Grab some extra deals and offers on merchant apps like Swiggy, BookMyShow, Netmeds, Goibibo and more get upto 40% cashback offers on every purchase or order prime member can avail extra Rs 250 cashback. Give surprise to your friends or family by sending them gifts during Amazon Great Indian Sale.